My journey through tracing my family tree. Family traditions, photos and travels. Sharing results of the search for my roots. When my mother passed away in October 1997, she was living with my sister Sharon in Palmdale, California. She was only 70 years old. Dad had passed way in 1995. There were only three of us now; Sharon, our brother George and myself. Sharon lived in a mobile home without a garage only a storage shed for seasonal items or “extra” stuff. 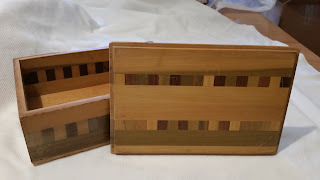 Before mom moved in, she had paired down her personal belongs and given away things she could no longer keep or store. About a month after mom’s passing, the three of us worked around our schedules and finally met at Sharon’s house to sort out mom’s effects. We don’t live close to each other, so it was hard to get together at the same time. We weren’t allowed to go into mom’s room unless she invited or asked us to get something for her. Walking into mom’s bedroom was surreal. She didn’t have much, mostly clothing and a few knick-knacks. Sharon started by opening closet doors and Mom’s dresser drawers. She pulled out items of clothing, laid them on the bed and said, “Take what you want.” We each made a pile of what we wanted to keep and started a Goodwill donation pile. 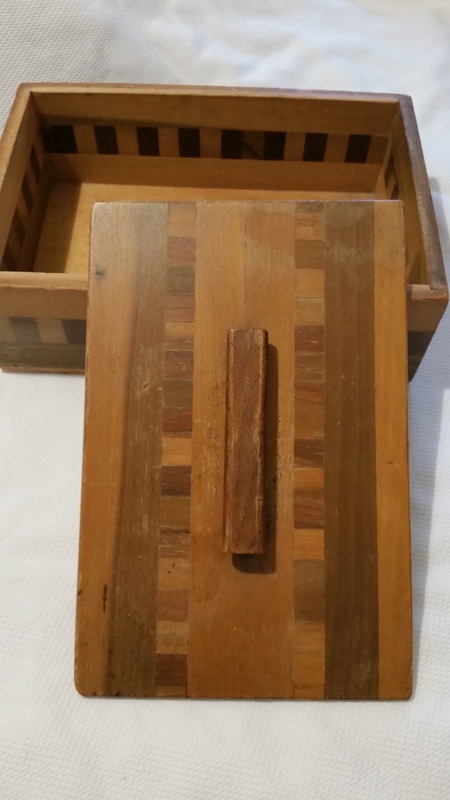 On mom’s dresser was an old, wooden, beaten-up box with a lift-off cover. She’d had the box for as long as I could remember. (It was small, only 8¾” x 6” x 2¾”.) 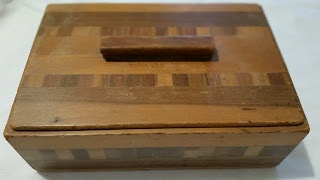 The box had a strip of wood parquet design that ran all around the body of the box, inside and out. The parquet design carried over to the top and bottom of the cover. The cover’s handle is made of a flat piece of wood and is centered on the top. This box has great significance for me. It reminds me of when I was a little girl and my family home was in Chicago, we were still a family unit, and not torn by divorce. I picked up the old box and carried it out to the living room and put it with my small pile of keepsakes. Memories came flooding back to me. Growing up, Mom had a large vanity in her bedroom. 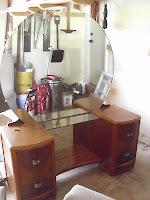 It consisted of a large round mirror, four wooden drawers on each side, two shelves between the drawers, and a small chair. This wooden box was kept on the bottom shelf of the vanity. It was one of the few items we could touch, open and look through. I remember various items she kept in there through the years. The items would change so it was fun to lift the lid and see what was new. Rosary beads, holy medals, funeral cards, and a small manicure set. After we moved to California, she kept Disneyland ride coupons, rubber banded together. When I was talking to my sister the other day about the box, she said she didn’t know who had it or what had happened to it. I told her I had it and later sent her a photo. She too had memories of playing with the box. I’ve kept the box in different places in my home. Not always in a prominent place — such as on a shelf in my bedroom. In the last few weeks, my husband has been remodeling our master bedroom. Everything had to come out of the room and is now in various parts of the house. I discovered mom’s box on top of a pile of things I had placed for safekeeping. I emptied it, dusted it off, and took numerous photos from different angles. My brother, George, has a piece of furniture that was in our family living room. My sister, Sharon, has a knick-knack that belonged to our maternal grandmother. I’m starting an inventory sheet on the various family keepsakes we each have from our family household. I want my children to know the provenance of each item and not just one day toss it away. The box has become a family heirloom. I don’t have unusual names on my family tree. Nothing I could use in a search box to help distinguish from other names. I have George, Philip, Mary, Marie, Maria, Robert, Richard, Sharon, Angela, Angie, Angeline, Dorothy, Henry. I’m the only Gayle on the whole tree. Of course, it’s not spelled like everyone else. I usually get Gail or Gale written on my coffee cup order. No matter, it doesn’t bother me like it did when I was younger. Back then, I didn’t even like my name. I would fantasize a different name like…Amanda. Then I’d have a nickname like Mandy. Looking through my RootsMagic database, I kept coming back to the name, George. It’s my father, brother and maternal great-grandfather’s name. No difference in spelling. Dad would sometimes shorten it as Geo. That’s the well-known abbreviation of George. I always liked the name for a boy or man. I also like the name Jennie. It sounds old, but not ancient old. It was my maternal grandmother’s given name. Growing up we always called her grandma Jean. I didn’t know her real name until someone referred to her as Jennie. When she passed away, we all found out her middle name, Sylvia. My mother and aunt both claimed them never of it. Grandma is the only Jennie on my tree. In 1978, my husband, David and I named our first born child, Jennifer. Her name is unique. She’s not named after anyone in particular. No other Jennifer on either side of her family tree. We had a hard time picking a girl’s name. At the time, we lived in a mobile home. I would shout different names down the long hallway to see how they sounded and if we liked them. When Jennifer was in kindergarten, my husband David and I went to our first parent-teacher conference. While waiting for the teacher to get Jennifer’s file, we strolled around the room admiring all the student crayon drawings that were displayed along the top of the chalkboard. We were shown which one was Jennifer’s. When I saw she wrote her name as “Jennie,” I stopped and stood there with my mouth open, gaping . Seeing my grandma’s name written by my little girl left me dumb-struck, unable to speak. I guess I expected she would spelling it J-e-n-n-y. I couldn’t get over she had chosen to spell it J-e-n-n-i-e without me telling her about her great-grandma. I felt like my grandma had reached down and squeezed my shoulder, giving her approval. I think I smiled all the way through the parent-teacher conference, and give Jennifer a special hug when we got home. I didn't know my paternal grandfather, Philip Ficarra, he died when I was three years old. My only memory is a very old, wrinkled man sitting in an upholstered rocking chair. I have several photos of Grandpa Phil, the photo below is a favorite. It was taken in Chicago, Illinois sometime in the 1930s. My father George, said he remembered his father wearing a straw skimmer hat all the time. Grandpa is wearing a tie, and with his shirt sleeves rolled up, it looks like it might be summer. I don't know what the event might be, or maybe he's at work and just stepped outside when the photo was taken. I got this copy from my sister, Sharon. She actually started on the genealogy journey in the 1980s. I picked it up in 2000 where she left off. She's been great to help me when I run into a snag with our family history. Grandpa Phil was married four times. Two of the women happened to be both of my grandmothers. His second wife, Angie, was my father's mother, he married her 1922. He married his fourth wife, Jennie, sometime in 1946. Jennie was my mother's mother. I'm still looking for their marriage record. This is how my parents met. Father and son, married mother and daughter. Grandpa Phil was my "brick wall" in my genealogy search. I couldn't get past him to his parents or grandparents. A few years ago, a friend of mine actually found his parent's marriage on Ancestry.com and FamilySearch.org. I've been grateful ever since. I still don't have Philip's birth record and I can't seem to find his family in any census or New Orleans, Louisiana city directories. They have once again become my "brick walls." I'm getting back to writing. 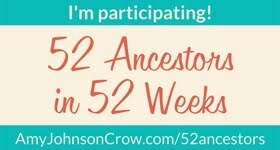 I signed up with Amy Johnson Crow's: 52 Ancestors in 52 Weeks challenge. I belong to a writing group once a month through my local society. I struggle, but the group helps me make sense of what I'm trying to say. I may not make all 52 weeks, but I'm willing to start. I came across this great motivator from Thomas MacEntee's Twitter feed and on Facebook: 18 Writing Tips for 2018: How to Tell Personal and Family Stories with Confidence. I especially like tip number 3, Make a Time Line of Major Life Events. I really like the concept. After reading the whole article, I shared the link on my society's Facebook page and sent the link to my writing group. I found a notebook I had and emptied out pages that had writing on them. Then I started to write down each year I've been alive. Left a page or two between each year and started adding in some of the big turning points of my life. I don't have to write about ancestors. I'll write about whomever I want. I just want to START! About two years ago, I ordered German church microfilms from the Family History Library in Salt Lake City. The only way to save the images was to snap a photo with my cell phone. The images weren't great, but using Photoshop Elements, I was able to piece two or three images together into one document. I could make out a few words like legitimate, baptism, family surnames but that was about all. Using a German dictionary, German word lists from Family Search Wiki, and Google translate - German to English, I still couldn't make out what the documents said. On the second day, I attended a session by speaker Antje Petty. Her lecture was: “Max Kade Institute: Resources to help with your German-American Family Research”. My ears perked up, this was just what I needed. Part of my road trip this month was to research my mother's German paternal line. I spoke briefly with Ms Petty after her session and she said to email her with my German document questions. Ms Petty's office was on the University of Michigan-Madison campus near the Wisconsin Historical Society. I made an appointment to meet with her the following Monday afternoon and sent my scanned documents in advance. Since I had planned on going to the historical society for research anyway, this was perfect. Over the weekend, Ms. Petty emailed me she wasn't feeling well, and would have to cancel our appointment. She said she looked over my scans and thought the documents might be in Latin, which she doesn't read, not German like I thought. That's why Google translate, the word lists and German dictionary couldn't decipher the documents. Wow, didn't see that coming! I would have to look into the documents after I got home. I was disappointed we couldn't meet but thanked her for the valuable translation tip. A week later Ms Petty email me and said again how sorry she was we couldn't meet, she had actually come down with the flu but taken a second look at my documents and they were definitely in Latin. Thank you, thank you and thank you again! I won't be wasting time trying to decipher German. I'll be looking into Google translation - Latin to English. That invaluable tip was well worth the trip. You just don't know what you're going to learn when you attend conferences. © 2015, Gayle Ficarra Wolcott. Picture Window theme. Powered by Blogger.